I feel so incredibly lucky, not only to have such good friends, but good friends who cook better than me! My lovely friend Jasleen introduced me “the Indian grocery store.” My culinary life will never be the same. I met Jasleen through my wonderful friend Katherine who is our local La Leche Leader. As with most conversations involving nursing, low milk supply was an issue. Jasleen explained that she never had this problem as Indian cooking (she cooks food from the Punjabi region) relies heavily on fenugreek which is an herb prescribed for low supply. She also mentioned using ginger in her meals and having few digestive issues as a result. Always a skeptic, I waited to visit our local Indian grocery store (Bollywood Spices) until I had tried her cooking–out of this world–and got to know her well enough to take her advice seriously. Ten pounds of Himalayan Basmati rice for twelve dollars! Three bunches of fresh-picked cilantro for a buck! Six month supply of rose incense for $3! Most of what I now cook is vegan and in addition to the great prices, I love the fact that I can nourish my family with every meal. Legumes are a superfood loaded with insoluble fiber, which helps with regularity and wards off cancer. Beans are also a staple in the Indian diet. Our kitchen is loaded with orange lentils, black chickpeas, ginger, cilantro, coconut milk, spinach, garlic and spices that promote health and taste delish! Recently, I purchased, “The Indian Slow Cooker.” It makes cooking restaurant-quality, health food very easy. If you have any good recipes please share them! I am delighted to be part of a wonderful (food) community. 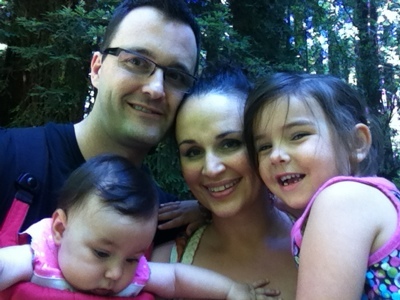 I used to write fiction to find the clarity I now receive from parenting. It sounds dubious and maybe a little self-righteous, but children have as much to teach as learn. I love my girls’ ability to feel each moment and be frank without asking for permission. Today, we were scheduled to have lunch with a friend of Ryan’s: everything was going wrong. First, I hadn’t slept the night before, we ran late, forgot to bring diapers to the restaurant and Sofia kept crying but our lunch companions were beyond lovely; a somewhat new couple in love and the feeling was infectious. I loved the way they met cute as they say in Hollywood . . . it involved handwritten notes, a national forest and luck or fate, whichever you prefer. Feeling so thankful for good friends and family today. Baby’s sweat and I wonder if this is a bad situation. Within what I feel looking at my daughter Olivia. Over the last several months I’ve incorporated less processed, more nutritionally-dense foods into our diet, and I’ve been tracking all my calories/work outs and now I’ve almost achieved my goal weight. Or, in other words, I’ve been eating for pleasure while picking foods that optimize my family’s health. For a salty snack we make kale chips in the afternoon (sea salt, lemon juice, dash of olive oil cooked at 350 degrees for thirty minutes) and after dinner we have been enjoying vegan lavender and lemon tea cookies and double chocolate cookies from recipes listed in The Vegan Table. For Ryan’s birthday, I wanted to bake him a cake that wouldn’t raise our glycemic index too much. Mix and cook for thirty minutes at 350 degrees. For frosting I mixed 2 tablespoons water, 2 cups Splenda, 1/5 teaspoon vanilla extract and 2 tablespoons of a butter substitute. We really enjoyed this cake. Granted, Splenda and artificial butter are low-fat but are also processed so we save them for special occasions. After indulging in our dessert (tasted a bit like angel food cake) we didn’t feel a sugar high and I didn’t gain weight despite my two or three slices of bliss. After Sofia’s swim lesson this afternoon I am making Caramelized Fennel and Goat Cheese pizza from My New Roots. I don’t have time to make flatbread from scratch so I’m picking up some semi-fresh naan from the deli section at Target. 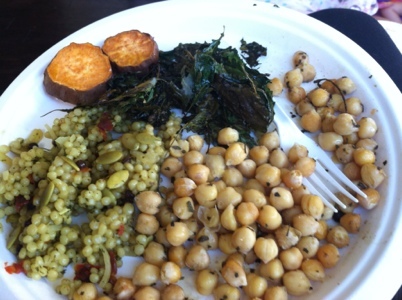 Kale chips, sweet potato fries, pumpkin couscous and chickpea popcorn was dinner the other night. Most of us make bad decisions sometimes when it comes to food hence the invention of black forest truffles, chocolate-avocado smoothies and other works of pure genius (the vegetarian version of In & Out’s burger.) I also understand obesity is one of the largest (public) health concerns yet, NYC Mayor Michael Bloomberg’s ban on large sodas really irks me. I am totally for food (and voter) education but his proposed ban reeks of classism; I mean, if we are banning all foods that potentially lead to being overweight, then who is going to march into the Waldorf-Astoria hotel and arrest the chef behind their signature “salad”? Two tablespoons of mayo per recipe!?! What were those senseless fat-promotors thinking? And if Mayor Bloomberg is banning sugar-filled soda drinks, well, he should definitely STOP ALL NEW YORKERS FROM FLYING TO PARIS: aka city of crepes and sinful croissants!!! All I’m saying is that if he can’t stop rich people from eating unhealthy food once in a while, then he can keep his hands off my pudgy, middle-class hips. On another note, if you are reading this sentence it means you are actually reading my blog so thank you Katherine–my kind, brilliant neighbor. I really enjoy having a voice, even if you are the only person who reads/hears it. When I feel anxious I usually turn to my kitchen. I know my food cravings are largely emotional, so I’ve decided to look to Ayurvedic medicine–an Indian practice of treating the mind and body–for my calming solution. Several years ago, I visited one of the most well-known Ayurveda centers in the world: The Ayurveda Institute. I was referred to a highly recommended Ayurvedic doctor, who explained there are three essential constitutions–I think of it as types of energy but I know it’s more than that–a person can have (a combination of these is also possible): Vata aka air, Kapha aka water and Pitta aka fire. You must know your constitution to understand what your body has in excess. After this, the imbalance can be treated. For example, I am Pitta (fire) therefore I need to work on cultivating Kapha (water). I went to The Ayurvedic Institute to treat an acidic stomach. The herbs and dietary recommendations I was prescribed helped me. Since I am a fire-y person I was told to wear blue, say relaxing mantras and eat foods that lacked the usual spice I crave. The idea that what we crave to eat is bad for us was a new idea for me; when I crave a food sometimes I wonder if it’s because of a nutritional imbalance whereas in this tradition the craved food is the result of excess. So this week I am consulting a book I bought at the institute, Ayurveda and the Mind, to cultivate balance. I will let you know my results. You can learn what your constitution is by going here.